Portable Countertop Burner Just $69.99! Down From $130! PLUS FREE Shipping! You are here: Home / Great Deals / Amazon Deals / Portable Countertop Burner Just $69.99! Down From $130! PLUS FREE Shipping! Head over to Amazon to score this Portable Countertop Burner for just $69.99 down from $129.99 PLUS FREE shipping! 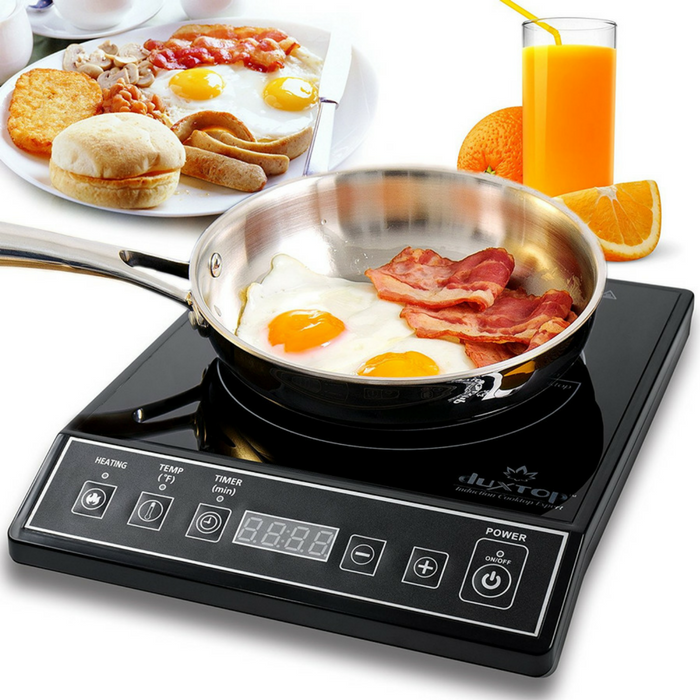 Duxtop Induction Cooktops use 120 volts, 15 amps of electricity – standard in all homes; lightweight and compact for easy handling and storage. With 15 power levels from 200-1800Watts; 15 temperature ranges from 140°F to 460°F; Digital control panel; Built-in count-down digital timer up to 170 minutes; auto-pan detection and diagnostic error message system, Low and high voltage warning system; 5 foot cord. This feature rich cooktop is compatible with Duxtop and other induction ready cookware; such as cast aluminum, enameled iron and steel, stainless steel with a magnetic bottom, or cast iron.